Ballistic performance isn’t lacking either. 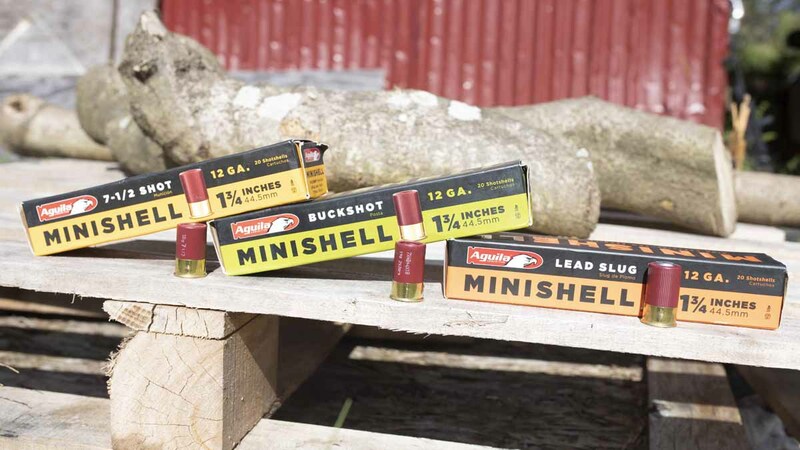 The seven pellet 00 Buckshot rounds have a muzzle velocity of 1,200 Feet per Second, which is on par with more well-known shotshells like the Express Magnum Buckshot made by Remington. The 25 gram slug performs just as well, with a muzzle velocity of 1,200 FPS, which is again on par with only slightly heavier one ounce slugs. And rounding out the trifecta, the #7 1/2 birdshot shells come in at 1,175 FPS and continue the trend of light recoil and high performance. About the only downside of the Mini Shells is that they don’t seem to feed consistently in some pump shotguns, and they sometimes fail to cycle semi-automatic shotguns. Depending on what you plan to use the shell for that may not be a problem, but it is something to be aware of. Now there is a product called the “mini-clip” made by a company called OPSol that claims to fix the feeding issues in a few specific pump shotguns, but we haven’t tested it and can’t say for sure. Overall the Aquila Mini Shells are a pretty interesting product. Fun and easy to shoot they will make a great addition to any shotgunners ammo collection. And as the tactical shotgun market continues to grow, look for more products to come online to address any feeding or cycling issues you may have.